Saint Ouen (Jerriais: Saint Ouen) is one of the twelve Parishes of Jersey in the Channel Islands. It is in the north west of Jersey. The parish is the largest parish by surface area, covering 8,341 vergees (15 km²). It is reputed to be the most traditional of the parishes, being the farthest from Saint Helier and with much of the territory of the parish forming a peninsula. Its manor, Saint Ouens Manor, the seat of the de Carteret family for over eight centuries - is the senior fief in the island, and the influence of that family has also been a factor in the parishs independent-minded approach to its affairs. A number of the most influential writers of Jersey have been St. Ouennais. George F. Le Feuvre (1891–1984), who wrote under the pseudonym "George dla Forge", was one of the most prolific authors of Jerriais literature of the 20th century. Frank Le Maistre (1910–2002), compiler of the Dictionnaire Jersiais-Francais (1966), did much to standardise the St. Ouennais dialect of Jerriais as a literary language. Edward Le Brocq (1877–1964) wrote a weekly newspaper column from 1946 to 1964 recounting the lives and opinions of two St. Ouennais characters, Phlip and Merrienne. The traditional nickname for St. Ouennais is Gris Ventres (grey bellies) - a reference to the custom of men from the parish to wear jerseys of undyed wool, which distinguished them from men from other parishes who generally wore blue. A number of prehistoric sites are located in St. Ouen, including the dolmen des Monts Grantez, located at Le Chemin des Monts; the dolmen des Geonnais; and the prehistoric site at Le Pinacle, which also contains one of the very few identifiable Gallo-Roman sites to be seen in Jersey, the foundations of a fanum (small temple). Sark was recolonised by St Ouenais. Helier de Carteret, the seigneur of the parish, received a charter from Queen Elizabeth I to colonise Sark with 40 families from the parish on condition that he maintain the island free of pirates. Sercquiais is therefore a very old offshoot of St Ouennais Jerriais. The St. Ouennais origins of Sercquiais can be seen in the 2nd and 3rd person plural forms of the preterite. Sercquiais uses an ending -dr which is typical of the St. Ouennais dialect of Jerriais, but generally not used elsewhere in Jersey (nor nowadays by younger speakers in St. Ouen). In the north west, the ruins of Grosnez Castle are a landmark which also features on the Jersey 50 pence coin (see coins of the Jersey pound). 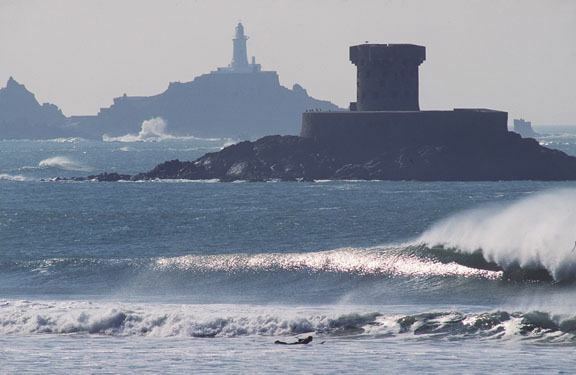 The Islands racecourse is also to be found at Les Landes.